Definition at line 28 of file CQBaseDataModel.h. Definition at line 22 of file CQBaseDataModel.cpp. Reimplemented in CQLayoutsDM, and CQParameterSetsDM. Definition at line 51 of file CQBaseDataModel.cpp. Referenced by CQPlotsWidget::slotBtnClearClicked(), CQReportsWidget::slotBtnClearClicked(), CQEventsWidget::slotBtnClearClicked(), CQReactionsWidget::slotBtnClearClicked(), CQCompartmentsWidget::slotBtnClearClicked(), CQFunctionsWidget::slotBtnClearClicked(), CQGlobalQuantitiesWidget::slotBtnClearClicked(), CQSpeciesWidget::slotBtnClearClicked(), and CQMiriamWidget::slotBtnClearClicked(). Definition at line 68 of file CQBaseDataModel.cpp. Referenced by CQReportDM::insertRows(), CQPlotDM::insertRows(), CQFunctionDM::insertRows(), CQReactionDM::insertRows(), CQEventDM::insertRows(), CQGlobalQuantityDM::insertRows(), CQCompartmentDM::insertRows(), CQSpecieDM::insertRows(), CQReportDM::setData(), CQPlotDM::setData(), CQReactionDM::setData(), CQFunctionDM::setData(), CQEventDM::setData(), CQGlobalQuantityDM::setData(), CQCompartmentDM::setData(), and CQSpecieDM::setData(). Implemented in CQSpecieDM, CQCompartmentDM, CQGlobalQuantityDM, CQEFMNetReactionDM, CQFluxModeDM, CQEFMSpeciesDM, CQEventDM, CQFunctionDM, CQReactionDM, CQCreatorDM, CQBiologicalDescriptionDM, CQReferenceDM, CQEFMReactionDM, CQPlotDM, CQModifiedDM, CQLayoutsDM, CQReportDM, CQTimeSeriesDM, and CQParameterSetsDM. Reimplemented in CQSpecieDM, CQCompartmentDM, CQGlobalQuantityDM, CQEFMNetReactionDM, CQFluxModeDM, CQEventDM, CQEFMSpeciesDM, CQFunctionDM, CQReactionDM, CQEFMReactionDM, CQPlotDM, CQLayoutsDM, CQReportDM, CQTimeSeriesDM, and CQParameterSetsDM. Definition at line 27 of file CQBaseDataModel.cpp. Implemented in CQSpecieDM, CQCompartmentDM, CQGlobalQuantityDM, CQEFMNetReactionDM, CQEFMSpeciesDM, CQFluxModeDM, CQEventDM, CQFunctionDM, CQReactionDM, CQCreatorDM, CQBiologicalDescriptionDM, CQReferenceDM, CQEFMReactionDM, CQPlotDM, CQModifiedDM, CQLayoutsDM, CQReportDM, CQTimeSeriesDM, and CQParameterSetsDM. Definition at line 38 of file CQBaseDataModel.cpp. Referenced by CQModifiedDM::setData(), CQReportDM::setData(), CQBiologicalDescriptionDM::setData(), CQReferenceDM::setData(), CQPlotDM::setData(), CQCreatorDM::setData(), CQFunctionDM::setData(), CQReactionDM::setData(), CQEventDM::setData(), CQGlobalQuantityDM::setData(), CQCompartmentDM::setData(), CQSpecieDM::setData(), CQParameterSetsWidget::slotBtnNewClicked(), CQPlotsWidget::slotBtnNewClicked(), CQReportsWidget::slotBtnNewClicked(), CQEventsWidget::slotBtnNewClicked(), CQReactionsWidget::slotBtnNewClicked(), CQCompartmentsWidget::slotBtnNewClicked(), CQFunctionsWidget::slotBtnNewClicked(), CQGlobalQuantitiesWidget::slotBtnNewClicked(), and CQSpeciesWidget::slotBtnNewClicked(). Implemented in CQSpecieDM, CQCompartmentDM, CQGlobalQuantityDM, CQEFMNetReactionDM, CQFluxModeDM, CQEFMSpeciesDM, CQEFMReactionDM, CQEventDM, CQFunctionDM, CQReactionDM, CQCreatorDM, CQBiologicalDescriptionDM, CQReferenceDM, CQPlotDM, CQTimeSeriesDM, CQLayoutsDM, CQModifiedDM, CQReportDM, and CQParameterSetsDM. Reimplemented in CQEFMNetReactionDM, CQFluxModeDM, CQEFMSpeciesDM, CQEFMReactionDM, CQLayoutsDM, CQTimeSeriesDM, and CQParameterSetsDM. Definition at line 56 of file CQBaseDataModel.cpp. 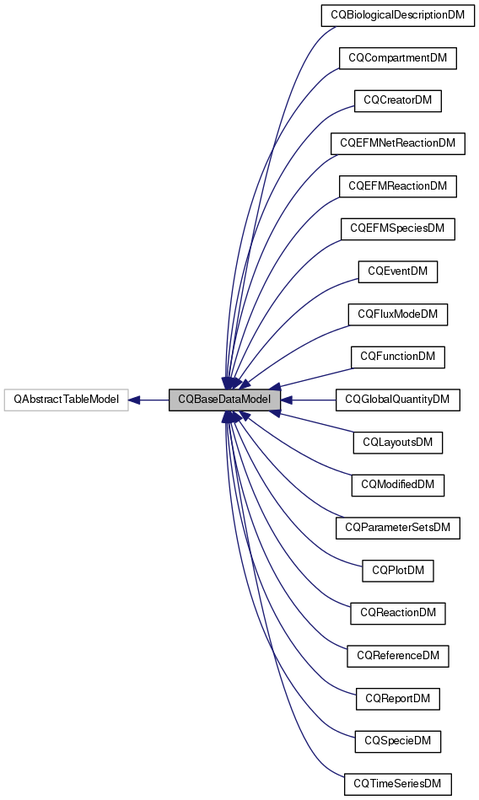 Referenced by CQSpinBoxDelegate::createEditor(), CQReportDM::data(), CQModifiedDM::data(), CQPlotDM::data(), CQReferenceDM::data(), CQBiologicalDescriptionDM::data(), CQCreatorDM::data(), CQFunctionDM::data(), CQReactionDM::data(), CQEventDM::data(), CQGlobalQuantityDM::data(), CQCompartmentDM::data(), CQSpecieDM::data(), CQFunctionDM::flags(), CQSpecieDM::flags(), CQSortFilterProxyModel::lessThan(), removeRow(), CQReportDM::removeRows(), CQModifiedDM::removeRows(), CQPlotDM::removeRows(), CQBiologicalDescriptionDM::removeRows(), CQReferenceDM::removeRows(), CQCreatorDM::removeRows(), CQReactionDM::removeRows(), CQFunctionDM::removeRows(), CQEventDM::removeRows(), CQGlobalQuantityDM::removeRows(), CQCompartmentDM::removeRows(), CQSpecieDM::removeRows(), CQReportDM::setData(), CQModifiedDM::setData(), CQPlotDM::setData(), CQReferenceDM::setData(), CQBiologicalDescriptionDM::setData(), CQCreatorDM::setData(), CQReactionDM::setData(), CQFunctionDM::setData(), CQEventDM::setData(), CQGlobalQuantityDM::setData(), CQCompartmentDM::setData(), CQSpecieDM::setData(), CQPlotsWidget::slotDoubleClicked(), CQReactionsWidget::slotDoubleClicked(), CQReportsWidget::slotDoubleClicked(), CQEventsWidget::slotDoubleClicked(), CQFunctionsWidget::slotDoubleClicked(), CQCompartmentsWidget::slotDoubleClicked(), CQGlobalQuantitiesWidget::slotDoubleClicked(), CQSpeciesWidget::slotDoubleClicked(), CQPlotsWidget::updateDeleteBtns(), CQReportsWidget::updateDeleteBtns(), CQReactionsWidget::updateDeleteBtns(), CQEventsWidget::updateDeleteBtns(), CQCompartmentsWidget::updateDeleteBtns(), CQFunctionsWidget::updateDeleteBtns(), CQSpeciesWidget::updateDeleteBtns(), and CQGlobalQuantitiesWidget::updateDeleteBtns(). Referenced by CQParameterSetsDM::insertRows(), CQReportDM::insertRows(), CQModifiedDM::insertRows(), CQLayoutsDM::insertRows(), CQReferenceDM::insertRows(), CQBiologicalDescriptionDM::insertRows(), CQPlotDM::insertRows(), CQCreatorDM::insertRows(), CQFunctionDM::insertRows(), CQReactionDM::insertRows(), CQEventDM::insertRows(), CQGlobalQuantityDM::insertRows(), CQCompartmentDM::insertRows(), CQSpecieDM::insertRows(), CQParameterSetsDM::removeRows(), CQReportDM::removeRows(), CQModifiedDM::removeRows(), CQReferenceDM::removeRows(), CQPlotDM::removeRows(), CQBiologicalDescriptionDM::removeRows(), CQCreatorDM::removeRows(), CQReactionDM::removeRows(), CQFunctionDM::removeRows(), CQLayoutsDM::removeRows(), CQEventDM::removeRows(), CQGlobalQuantityDM::removeRows(), CQCompartmentDM::removeRows(), CQSpecieDM::removeRows(), CQModifiedDM::setData(), CQReportDM::setData(), CQBiologicalDescriptionDM::setData(), CQPlotDM::setData(), CQReferenceDM::setData(), CQCreatorDM::setData(), CQFunctionDM::setData(), CQReactionDM::setData(), CQEventDM::setData(), CQGlobalQuantityDM::setData(), CQCompartmentDM::setData(), CQSpecieDM::setData(), and CQReactionDM::setEquation(). Definition at line 43 of file CQBaseDataModel.cpp. Referenced by CQParameterSetsDM::removeRows(), CQModifiedDM::removeRows(), CQReportDM::removeRows(), CQLayoutsDM::removeRows(), CQPlotDM::removeRows(), CQReferenceDM::removeRows(), CQBiologicalDescriptionDM::removeRows(), CQCreatorDM::removeRows(), CQFunctionDM::removeRows(), CQReactionDM::removeRows(), CQEventDM::removeRows(), CQGlobalQuantityDM::removeRows(), CQCompartmentDM::removeRows(), and CQSpecieDM::removeRows(). Implemented in CQSpecieDM, CQCompartmentDM, CQGlobalQuantityDM, CQEFMNetReactionDM, CQFluxModeDM, CQEFMSpeciesDM, CQEFMReactionDM, CQEventDM, CQLayoutsDM, CQFunctionDM, CQReactionDM, CQCreatorDM, CQBiologicalDescriptionDM, CQReferenceDM, CQPlotDM, CQTimeSeriesDM, CQModifiedDM, CQReportDM, and CQParameterSetsDM. Referenced by clear(), and removeRow(). Implemented in CQSpecieDM, CQCompartmentDM, CQEFMNetReactionDM, CQFluxModeDM, CQGlobalQuantityDM, CQEFMSpeciesDM, CQEFMReactionDM, CQEventDM, CQFunctionDM, CQReactionDM, CQCreatorDM, CQBiologicalDescriptionDM, CQReferenceDM, CQPlotDM, CQModifiedDM, CQLayoutsDM, CQReportDM, CQTimeSeriesDM, and CQParameterSetsDM.